Center of Liver Transplantation, The First Affiliated Hospital of Nanjing Medical University, The Key Laboratory of Living Donor Liver Transplantation, Ministry of Health, Nanjing 210029, China. Norcantharidin (NCTD), a demethylated form of cantharidin, has been used as a routine anticancer drug in China. In this study, the effect and mechanism of NCTD on anti-hepatocellular carcinoma (HCC) was examined. In vivo antitumor activity was investigated in hepatoma-bearing mice by intraperitoneal injection of different concentration of NCTD. The levels of MicroRNAs (miRNAs) and mRNA were detected by real-time PCR. The concentrations of IL-10 and IL-12 in BMDMs, Raw 264.7 cells or tumor-associated macrophages (TAMs) were measured with ELISA kit. The effects of TAMs on H22 cell survival and invasion were assayed via the CCK-8 and tumor invasion assay, respectively. Anti-miR-214 or pre-miR-214 was used to down-regulate or up-regulated miR-214 expression. The results showed that NCTD drastically impaired tumor growth in hepatoma-bearing mice, correlating with increased anti-tumor activity of TAMs. Moreover, NCTD stimulation led to an alteration of HCC microenvironment, reflected by a decrease in a shift from M2 to M1 polarization and the populations of CD4+/CD25+Foxp3 T cells. The activation of STAT3 was inhibited in TAMs from hepatoma-bearing mice injected with NCTD. Addition of NCTD to treat RAW264.7 or TAMs enhanced M1 polarization through increase of miR-214 expression. NCTD significantly inhibited β-catenin expression, which could be reversed by miR-214 inhibitor. Conditioned media from TAMs in hepatoma-bearing mice treated with NCTD or TAMs transfected with pre-miR-214 inhibited survival and invasion of H22 cells. This finding reveals a novel role for NCTD on inhibition of HCC through miR-214 modulating macrophage polarization. Keywords: Norcantharidin, hepatocellular carcinoma, microenvironment, macrophage polarization, miR-214. Hepatocellular carcinoma (HCC) is one of the most common malignant tumors worldwide, particularly high in China . One of characteristics of HCC is an inflammation-related cancer and represents interaction of tumor cells with tumor microenvironment . Several studies indicate that tumor-associated macrophages (TAMs) play a key role in tumor progression of HCC . It has been confirmed that TAMs are mainly polarized towards M2 phenotype and favors tumor formation and progression . As a result, targeting TAMs is a useful and effective tool for HCC therapies. Accordingly, inhibition of TAMs recruitment, interference with their survival, or modulation TAMs into a M1 anti-tumoral phenotype have been proposed to treat cancer. MicroRNAs (miRNAs) are 19-24 nucleotides long non-coding RNAs involved in modulating gene expression . miRNAs play a pivotal role in a wide range of physiological processes, such as development, metabolism and differentiation . Under pathological conditions, deregulation or dysfunction of miRNAs is directly implicated in the process of tumorigenesis, including HCC . Some miRNAs such as miR-122, miR-26, miR-125b, miR-99a and miR-199a-3p acted as tumor suppressors . On the other hand, miR-21, miR-155 and miR-221 exerted an oncogenic activity to stimulate growth and prevent apoptosis of HCC cells . In recent years, the role of miR-214 in progression of HCC has received great attention. miR-214 was significantly down-regulated in HCC tissues and overexpression of miR-214 could inhibit HCC cell growth and invasion [10-11]. Moreover, miR-214 downregulation was associated with the low clinical progression and poor prognosis of HCC . 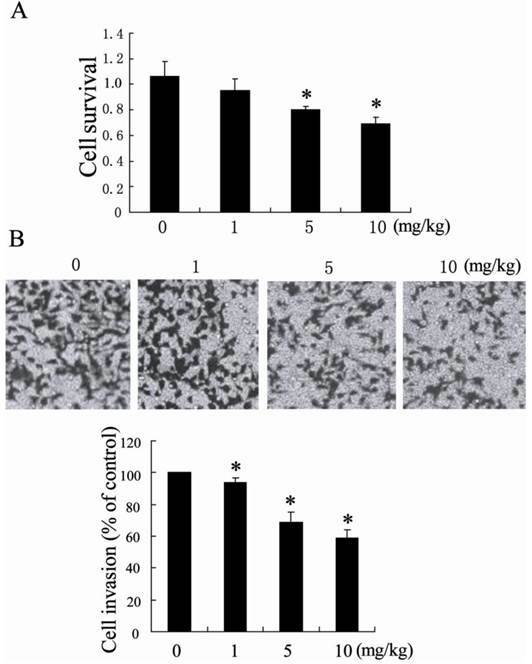 Cantharidin, the active constituent of blister beetles (one type of Chinese traditional medicine), has anti-tumor activity against multiple cancer cells . However, severe toxicity of cantharidin becomes the greatest barrier to its clinical application. Norcantharidin (NCTD) is a demethylated form of cantharidin with less cytotoxicity and has been used as a routine anticancer drug in China . NCTD could inhibit proliferation and metastasis of several kinds of cancers including lung cancer, colorectal cancer, liver cancer and so on [15-17]. However, the molecular mechanism of NCTD on anti-tumor is not clear. Therefore, in the present study, we have investigated the effect of NCTD on anti-hepatocellular carcinoma in vitro and in vivo, and explore the underlying mechanisms associated with this activity. Animals were treated humanely, using approved procedures in accordance with the guidelines of the Institutional Animal Care and Use Committee at Nanjing Medical University. The study was approved by the Experimental Animal Ethics Committee at the Nanjing Medical University. RPMI 1640 and DMEM were obtained from GIBCO (Invitrogen Company). Fetal bovine serum (FBS) was from Hyclone (Logan, UT, USA). Recombinant mouse M-CSF was purchased from R & D Systems (Minneapolis, MN, USA). Lipofectamine 2000 transfection reagent was obtained from Invitrogen Life Technologies (Grand Island, NY, USA). NCTD was purchased from Sigma Aldrich (St Louis, MO, USA). Anti-mouse CD4-fluorescein isothiocyanate (FITC), anti-mouse CD25-phycorescein (PE), and anti-mouse Foxp3-Cy3 were obtained from eBioscience (San Diego, CA, USA). Antibodies against β-catenin and β-actin were purchased from Santa Cruz Biotechnology (Santa Cruz, CA, USA). The Detergent Compatible (DC) Protein Assay kit was purchased from Bio-Rad Laboratories (Hercules, CA, USA). The miRNeasy Mini kit, the miScript Reverse Transcription kit and the miScript SYBR Green PCR kit were purchased from Qiagen (Hilden, Germany). The mouse hepatoma H22 cell line (syngenic to the Kunming strain of mice), human hepatoma cell line HepG2, normal hepatic cell line L02 and mouse macrophage cell line Raw 264.7 cells were obtained from Chinese Academy of Sciences (Shanghai, China). H22 cells were cultured in complete RPMI 1640, and then 1 × 107 cells (300 μL) were injected into the abdominal cavity of mouse. Seven days later, the intraperitoneal tumor cells were collected from the mouse with ascites tumor. HepG2 and Raw 264.7 cells were cultured in DMEM with 10% FBS and maintained at 37°C in a humidified incubator containing 5% CO2. Cultured cells were treated with cantharidin (dissolved in DMSO) in complete medium. To obtain reliable results, the final concentration of DMSO in the culture medium was kept less than 0.1%. Murine bone marrow-derived macrophages (BMDMs) were generated by flushing bone marrow cells from femurs and tibias of 6-8-week old BALB/c mice. These cells were cultured in DMEM supplemented with 10% FBS and 100 ng/ml recombinant mouse M-CSF for 7 days. Adherent macrophages were washed 3 times with warm Hanks' buffered salt solution (HBSS, Sigma). Then, cells were harvested and seeded at 2×105 cells per well in the 24 well plates in the above culture medium without M-CSF and treated with different concentration of cantharidin. Kunming and BALB/c male mice were purchased from Shanghai Laboratory Animal Centre (Chinese Academy of Sciences, Shanghai, China). The hepatocellular carcinoma model of mice was performed according to a previously reported method . Briefly, H22 cells were harvested from in vivo passage as mentioned above in the cell culture. Then, 0.2 mL (about 0.5×107 cells) of cell suspension was injected into the abdominal cavity of Kunming mouse (n=80). Seven days later, mice were randomly and equally divided into 8 groups. Group 1 mice were administered with saline buffer. Groups 2, 3 and 4 mice were treated with 1 mg/kg NCTD, 5 mg/kg NCTD and 10 mg/kg NCTD, respectively. Group 5 were treated with negative control oligonucleotide. Group 6 mice were administered with miR-214 inhibitor. Group 7 mice were received with NCTD + negative control treated. Group 8 mice were received with NCTD + miR-214 inhibitor, in which miR-214 inhibitor was pretreated for 2 hours and then injected with NCTD. Cholesterol-conjugated miR-214 inhibitor and negative control for in vivo RNA delivery were from RiboBio (Guangzhou, China). NCTD in 1.0 ml of saline buffer was treated by intraperitoneal injection every 2 days for 2 weeks. Negative control and miR-214 inhibitor (10 nmol) in 0.1 ml of saline buffer was administered intratumorally every 2 days for 2 weeks. Tumor growth was assessed 2 times per week with caliper measurement. TAMs were isolated from the tumors according to other's report . Briefly, small pieces of solid tumors tissue was digested with0.125% (wt/vol) Trypsin (Sigma) for 40 minutes at 37°C, followed by washing twice in incomplete RPMI 1640 medium. Cells were seeded in dishes of RPMI 1640 medium with 10% FBS and, after 12 h of incubation, non-adherent cells were vigorously washed off. The adherent cells were greater than 95% macrophages. TILs were isolated from the tumors according to other's report . Briefly, small pieces of solid tumors tissue was digested with an enzyme cocktail containing 5% fetal bovine serum in RPMI 1640, 0.5 mg/ml collagenase A (Roche), 0.2 mg/ml hyaluronidase, type V (Sigma) and 0.02 mg/ml DNase I (Sigma) per 0.25 g of tumor tissue. The cell suspensions were filtered through a cell strainer (70 µm, Becton Dickinson, CA, USA), and then, they were washed with 5% FBS in RPMI 1640. After lysed red blood cells, the cell clumps were removed by discontinuous gradient centrifugation using a Lympholyte-M gradient. TILswere harvested from the tumors and the percentages of CD4+CD25+Foxp3+ T cells were calculated. For intracellular staining, monoclonal antibody to surface molecules, including Anti-CD4-FITC, anti-CD25-PE, and anti-Foxp3-Cy3 were used to stain surface markers. The percentage of CD4+CD25+Foxp3+ T cells was computed using Cell-Quest software (Becton Dickinson). Once the cells were washed a further two times, the number of Foxp3-positive cells on the gating of CD4+cells was evaluated by cytometer, and the frequency of Foxp3+ Treg cells was expressed as a percentage of the total CD4+cells. BMDMs, H22 cells, HepG2 cells, Raw 264.7 cells and TAMs were seeded in 6-well or 24-well plates and transfected using Lipofectamine 2000 (Invitrogen, Carlsbad, CA, USA) according to the manufacturer's instructions. For the knockdown of miR-214, anti-miR-214 (Ambion) or a negative-control anti-miRNA (anti-NC) was used at the concentration of 100 nM. For the overexpression of miRNA-214, pre-miR-214 (Ambion) or a control pre-miRNA (pre-NC) was also used at the concentration of 100 nM. The cells were harvested 24 h after the transfection. Approximately 5×106 cells were treated without (Control) or with NCTD for 24 h. Mature miRNAs were isolated and purified using Trizol reagent (Invitrogen, USA), according to manufacturer's protocol. The levels of miRNAs (miR-155, miR-147, miR-214, and miR-455) were quantified by using a TaqMan PCR kit. Real-time PCR was performed with LightCycler 480, and with U6 small nuclear RNA as an internal normalized reference. The mRNA expression of Nos2 and MR was performed using SYBR GREEN PCR Master Mix (Applied Biosystems). The specific primers were as follows: Nos2, 5'-CTCTGAGGGCTGACACAAGG-3' (forward) and 5'-CTCCAAGCCAAAGTCCTTAGAG-3' (reverse); Arg1, 5'-AGGAGCTGTCATTAGGGACATC-3' (forward) and 5'-AGAAGGGAGTTTCAAACCTGGT-3'(reverse); GAPDH, 5'-TGAAGCAGGCATCTGAGGG-3' (forward) and 5'-CGAAGGTGGAAGAGTGGGAG-3' (reverse). All data were analyzed using GAPDH gene expression as an internal standard. Analysis of IL-10 and IL-12 was performed using an ELISA kit according to manufacturer's protocol. Briefly, BMDMs, Raw 264.7 cells or TAMs were collected and lysed for the measurement of cytokines concentration. Production of IL-10 and IL-12 was normalized to protein concentrations using the DC protein assay kit (Bio-Rad). H22 cells and TAMs were co-cultured at 1:1 in 96-well plates at a density of 1×104 per well for 24h. The cell survival was assayed via the CCK-8 method (Yes Service Biotech Inc. Shanghai China). Tumor invasion assay was done using modified Boyden chambers (8-μm pore size, BD Biosciences, USA), in which the various cellular components were grown without direct cell-to-cell contact. Briefly, the membrane was coated with Matrigel (BD) diluted 1/5 in serum-free DMEM media on ice. H22 cells (1×105 cells) were seeded in the upper well of the chamber, and the lower well was filled with TAM cells. After co-culture for 18 h, the transwells were removed from the 24-well plates, and the non-invaded cells were scraped off the top of the Transwell filters with a cotton swab. The filter was fixed formaldehyde (4%) and stained with 0.1% crystal violet in 2% methanol. Invasiveness was determined by counting cells in five microscopic fields per well, and the extent of invasion was expressed as an average number of cells per microscopic field. Cell viability was determined using MTT [3-(4,5-dimethylthiazol-2-yl)-2,5-diphenyltetrazolium bromide] assays. The cells were seeded in 96-well dishes at 1×104 to 2×104 cells per well and pretreated with or without ART for 24 h. Each well was supplemented with 10 μl MTT (Sigma Aldrich) and incubated for 4 h at 37°C. The medium was subsequently removed, and 150 μl DMSO (Sigma Aldrich) were added to solubilize the MTT formazan. The optical density was observed at 490 nm. Statistical analysis was performed with statistical analysis software SPSS 13.0 software. Statistical analyses were performed using either an analysis of variance (ANOVA) or Student's t-test. Data were expressed as mean ± standard deviation. P < 0.05 was considered to be significant. To address the effect of NCTD therapy for hepatocellular carcinoma, the murine hepatic carcinoma model was established. Alterations in tumor growth were monitored 2 times per week. NCTD treatment significantly inhibited tumor growth in dose-dependent manner (Figure 1A). For instance, when hepatoma-bearing mice were treated with NCTD 5 mg/kg for 2 weeks, the tumor size was decreased to 38.2%. And the tumor size was decreased to 18.3% after treatment with 10 mg/kg NCTD. On Day 24 after the H22 cells were injected, the mice were sacrificed and the tumor weights were measured. We observed that treatment with NCTD resulted in reductions of average tumor weight in a dose-dependent manner. Antitumor efficacy of NCTD in vivo. The hepatoma-bearing mice were treated with 0 mg/kg (group 1), 1 mg/kg (group 2), 5 mg/kg (group 3) and 10 mg/kg (group 4) NCTD by intraperitoneal injection. (A) Tumor sizes on each mouse were monitored 2 times per week and (B) tumor weights were measured. *P < 0.05, indicate significant differences from group 1. It has been known that TAMs are critical regulators of the tumor microenvironment and directly affect tumor cells growth, survival, invasion, and metastasis . To determine whether TAMs from NCTD-treated HCC tissue had anti-tumor activity, we incubated TAMs isolated from NCTD-treated HCC tissue with H22 cells. H22 cells were co-cultured 1:1 with TAMs and determined tumor cell survival and tumor cell invasion. Compared with TAMs from saline buffer-treated HCC tissue, TAMs from NCTD-treated HCC tissue significantly decreased H22 cells survival and inhibited H22 cells invasion (Figure 2). Antitumor effects of TAMs from NCTD-treated hepatocellular carcinoma tissue. 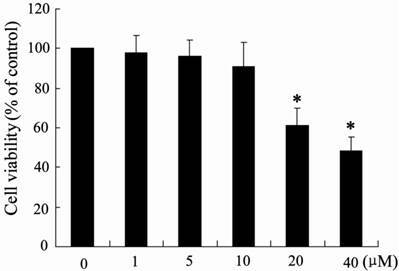 (A) H22 cell survival after 24 h co-culture with TAMs isolated from hepatoma-bearing mice treated with 0 mg/kg, 1 mg/kg, 5 mg/kg and 10 mg/kg NCTD by intraperitoneal injection (B) H22 cell were co-cultured with TAMs in a modified chamber without direct cell-to-cell contact for 18 h. The invasion of H22 cells was assessed by counting the cells in the basolateral side of the transwell filters under a light microscope. *P < 0.05, indicate significant differences from TAMs isolated from hepatoma-bearing mice treated with 0 mg/kg NCTD. It has been known that M1 macrophages produce pro-inflammatory cytokines such as IL-12 and exert anti-tumor effect, while M2 macrophages produce IL-10 cells and promote tumor progression . To determine whether NCTD treatment elicited a shift of macrophage phenotype from M2 to M1 within HCC environment, we detected the expression of Nos2 (the marker of M1 macrophages), and Arg-1 (the marker of M2 macrophages) in TAMs from hepatoma-bearing mice injected with saline buffer or NCTD. As shown in Figure 3A, TAMs from hepatoma-bearing mice injected with NCTD had an M1 phenotype, in terms of much higher expression of Nos2 but much lower expression of Arg-1. Furthermore, the shift in macrophages was also elicited using ELISA analysis. TAMs from NCTD-treated HCC tissue had a significantly higher IL-12 level but lower IL-10 level than those from saline buffer-treated HCC tissue (Figure 3B), which supported the possibility that NCTD treatment induces a shift from M2 to M1 polarization in the HCC tissues. 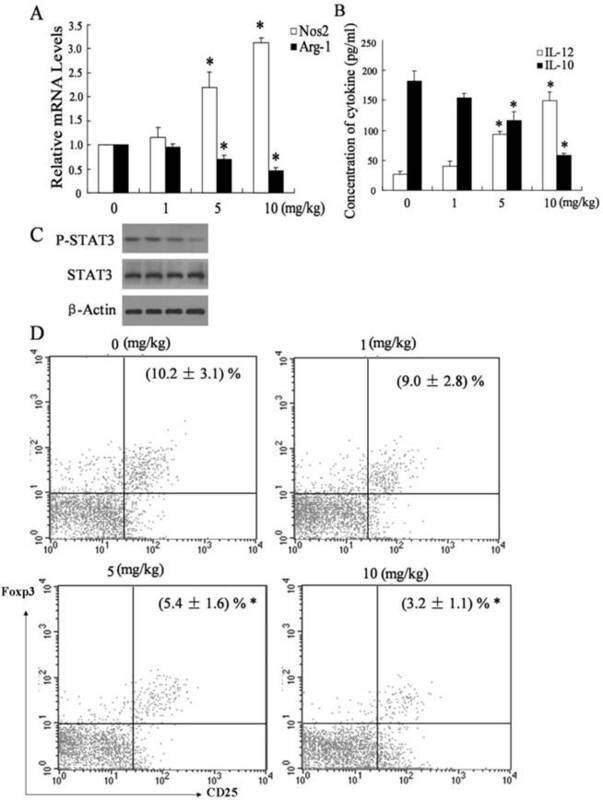 It has been reported that inhibition of STAT3 activation in TAMs could suppress the growth and metastasis of tumor cells. . To explore whether STAT3 pathway was implicated in the effect of TAMs on HCC cells, we measured phosphorylation of STAT3 and total STAT3 levels in TAMs from hepatoma-bearing mice injected with saline buffer or NCTD. As shown in Figure 3C, TAMs from hepatoma-bearing mice injected with NCTD exhibited down-regulation of STAT3 phosphorylation, while total STAT3 protein levels remained constant. Another effect of TAMs on tumor cells is induction of immunosuppressive state. TAMs triggered a rise of the intratumoral Foxp3+Treg population, which in turn promoted HCC progression . To determine whether NCTD treatment decreased the presence of Tregs at the tumor site, we detected the populations of CD4+/CD25+Foxp3 T cells in TILs from hepatoma-bearing mice injected with saline buffer or NCTD. As shown in Figure 3D, the prevalence of CD4+/CD25+Foxp3 T cells in TILs from hepatoma-bearing mice injected with NCTD was significantly lower than that injected with saline buffer. However, the molecular mechanisms needed to be further investigated. Administration of NCTD associated a shift from M2 to M1 polarization in HCC environment. (A) The expression of Nos2 and Arg-1 was measured in TAMs from hepatoma-bearing mice injected with different concentration of NCTD. (B) The concentration of IL-12 and IL-10 in TAMs from hepatoma-bearing mice injected with different concentration of NCTD. (C) The expression of P-STAT3 and STAT3 was measured in TAMs from hepatoma-bearing mice injected with different concentration of NCTD. (D) The population of CD4+/CD25+Foxp3 T cells in TILs from hepatoma-bearing mice injected with different concentration of NCTD. *P < 0.05, indicate significant differences from TAMs isolated from hepatoma-bearing mice treated with 0 mg/kg NCTD. To further explore the mechanism of NCTD inducing a shift from M2 to M1 polarization in the HCC tissues, we measured the expression of many miRNAs including miR-214, miR-147, miR-155 and miR-455, which may be involved in polarization of macrophages . Real-time PCR assays showed that, among these miRNAs, miR-214 was significantly up-regulated in TAMs from hepatoma-bearing mice injected with NCTD (Figure 4A). The modulation effect of miR-214 in macrophage polarization by NCTD. (A) The expression of many miRNAs including miR-214, miR-147, miR-155 and miR-455 was detected in TAMs from hepatoma-bearing mice injected with NCTD. *P < 0.05, indicate significant differences from TAMs isolated from hepatoma-bearing mice treated with 0 mg/kg NCTD. (B) The expression of miR-214 in BMDMs or RAW 264.7 macrophages treated with different concentration of NCTD was measured. *P < 0.05, indicate significant differences from 0 mol/L NCTD treatment. (C) After transfected with anti-miR-214 for 24 h, BMDMs or RAW 264.7 macrophages were treated with NCTD (10 μmol/L). Then, the relative mRNA level of Nos2 was determined. (D) After transfected with anti-miR-214 for 24 h, BMDMs or RAW 264.7 macrophages were treated with NCTD (10 μmol/L). Then, the protein level of β-catenin was determined. *P < 0.05, indicate significant differences from the respective control groups. We also determined the miR-214 expression in BMDMs or RAW 264.7 macrophages treated with different concentration of NCTD. 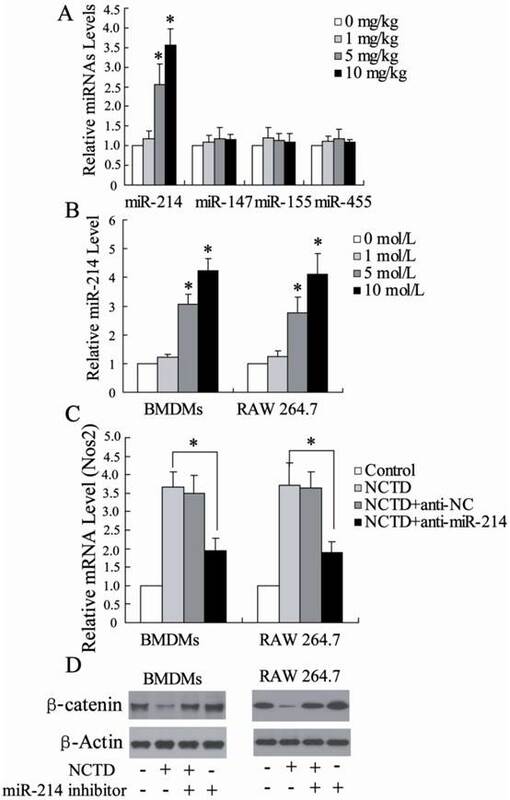 As shown in Figure 4B, NCTD significantly increase miR-214 expression in dose-dependent manner. Besides, BMDMs or RAW 264.7 macrophages stimulated with NCTD had an M1 phenotype, in terms of much higher expression of Nos2. Next, the role of miR-214 in macrophage polarization induced by NCTD was further explored. 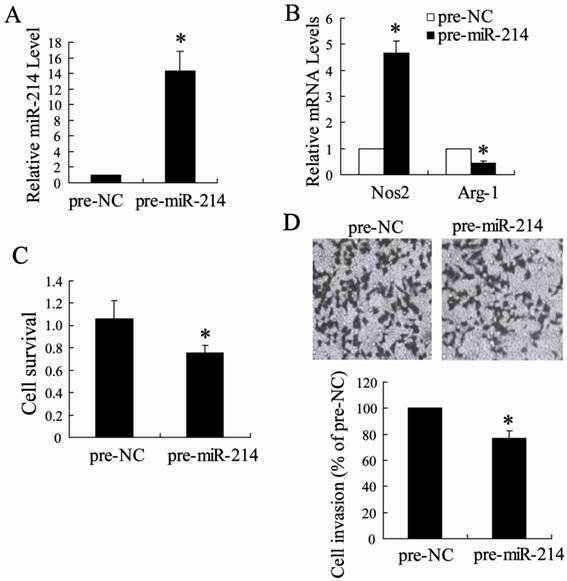 Through depleting miR-214 in macrophages using a miR-214 inhibitor, the M1 polarization induced by NCTD was inhibited (Fig. 4C), suggesting that the promotion of macrophage M1 polarization by NCTD might act through the up-regulation of the miR-214 level. Recent studies revealed that β-catenin, a direct target of miR-214, was involved in cell growth and cell invasion of HCC . The effect of NCTD on β-catenin expression in BMDMs or RAW 264.7 macrophages was investigated. As shown in Fig. 4D, NCTD significantly inhibited β-catenin expression, which could be reversed by miR-214 inhibitor. In addition, miR-214 inhibitor increased β-catenin protein levels, which is similar to previous reports . These data suggest that NCTD could decrease β-catenin protein levels by regulating miR-214 expression. To determine whether the TAMs that are up-regulated miR-214 expression have the tumor-killing function possessed by M1 macrophages, we first transfected TAMs isolated from hepatoma-bearing mice injected with NCTD with pre-miR-214 or pre-NC. The result of real-time PCR revealed that pre-miR-214 can significantly increase the expression of miR-214 in TAMs (Fig. 5A), suggesting that pre-miR-214 is efficiently introduced into the cells and acts to up-regulate miR-214 expression. TAMs transfected pre-miR-214 had an M1 phenotype with higher expression of Nos2 and lower expression of Arg-1 (Fig. 5B). Then, H22 cells were co-cultured 1:1 with these 'modified' TAMs and determined tumor cell survival and tumor cell invasion. Compared with TAMs transfected with a control oligonucleotide, TAMs overexpressing miR-214 significantly decreased H22 cells survival and inhibited H22 cells invasion (Figure 5C and D). Antitumor effects of TAMs modified by miR-214. (A) The expression of miR-214 was detected in TAMs transfected with pre-miR-214. (B) The expression of Nos2 and Arg-1 was measured in TAMs transfected with pre-miR-214. (C) H22 cell survival after 24 h co-culture with TAMs transfected with pre-miR-214 (D) H22 cell were co-cultured with TAMs transfected with pre-miR-214. The invasion of H22 cells was assessed by counting the cells in the basolateral side of the transwell filters under a light microscope. *P < 0.05, indicate significant differences from pre-NC. To explore the role of miR-214 in the effect of NCTD on inhibition of tumor growth in hepatoma-bearing mice, we treated mice with the cholesterol-conjugated miR-214 inhibitor. 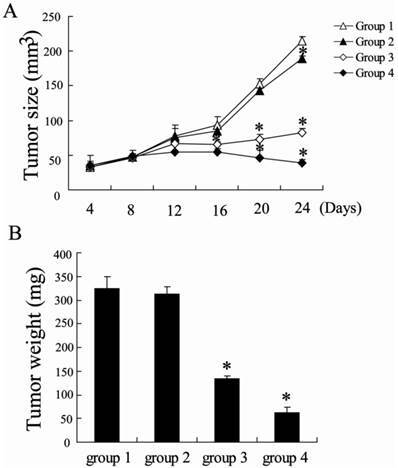 After intratumoral administration of miR-214 inhibitor, a slight increase in tumor size was observed in hepatoma-bearing mice. 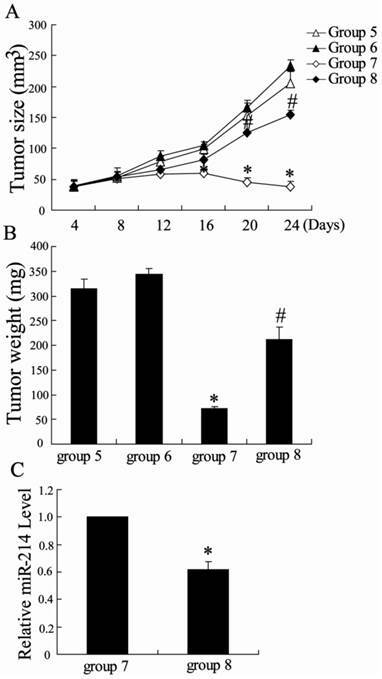 However, miR-214 inhibitor significantly reversed the effect of NCTD on tumor growth (Figure 6). Besides, the expression of miR-214 was significantly decreased in TAMs from hepatoma-bearing mice injected with NCTD and miR-214 inhibitor. These results indicate that NCTD can effectively suppress HCC tumor growth, which was involved in miR-214 expression. Antitumor effects of miR-214 in vivo. The hepatoma-bearing mice were treated with negative control oligonucleotide (group 5), miR-214 inhibitor (group 6), NCTD + negative control (group 7) and NCTD + miR-214 inhibitor (group 8). (A) Tumor sizes on each mouse were monitored 2 times per week and (B) tumor weights were measured. *P < 0.05, indicate significant differences from group 5. #P < 0.05, indicate significant differences from group 7. (C) The expression of miR-214 was detected in TAMs from group 7 and group 8. *P < 0.05, indicate significant differences from group 7. It has been reported that NCTD is involved in inhibiting the proliferation of HCC cells . Therefore, the potential effects of NCTD on H22 cell viability were evaluated using MTT assays. Notably, as shown in Fig. 7, NCTD did not significantly inhibit H22 cell viability at 1-10 μM, although NCTD was capable of decreasing cell viability in a dose-dependent manner at higher concentrations (> 10 μM). However, 10 μM NCTD significantly induced macrophage M1 polarization (Fig. 4C), which indicated that NCTD could exert anti-tumor activity through modulating macrophage polarization at low dosage. The effect of NCTD on H22 cell viability. H22 cells were incubated with the indicated concentration of NCTD for 24 h, and the cell viability was measured using a MTT assay. *p < 0.05, versus vehicle alone-treated cells. Cantharidin, the active constituent of Chinese blister beetle, has antitumor activity against various cancers cells . In clinics, NCTD, a demethylated form of cantharidin, has been used in the treatment of hepatoma with little toxic effect . The present study focuses on the mechanism of NCTD on anti-HCC in vivo and in vitro. We found that NCTD could inhibite tumor growth in hepatoma-bearing mice associated with a shift from M2 macrophages to M1 macrophages polarization. Besides, TAMs from NCTD-treated HCC tissue could inhibit HCC survival and invasion. Our data also showed that miR-214 was implicated in macrophage polarization modulated by NCTD. More importantly, inhibition of miR-214 expression could attenuate the effect of NCTD on anti-HCC. It should be mentioned that there was no difference of the weight among mice in each group (data not shown), which indicated that NCTD could play the role in anti- HCC with low cytotoxicity. Macrophages take part in the tumor microenvironment and play a dual role on tumor development and progression . Classically activated M1 macrophages exert anti-tumor effect through the release of pro-inflammatory cytokines. On the contrary, alternatively activated M2 macrophages facilitate the progression of tumors through the release of anti-inflammatory cytokines . As a result, tumor-associated macrophages have been the target for cancer treatment. Our results showed that Arg1, the M2 TAMs marker, was clearly reduced in hepatoma-bearing mice treated with NCTD. In contrast, Nos2, the M1 TAMs markers, was higher in tumors from mice treated with NCTD, which displayed an enhanced M2:M1 ratio. Likewise, BMDMs or RAW 264.7 macrophages stimulated with cantharidin had an M1 phenotype, in terms of much higher expression of Nos2. It has been reported that inhibition of STAT3 activation in TAMs could result in a shift from M2 to M1 polarization to suppress the growth and metastasis of tumor cells . The present study also showed that TAMs from hepatoma-bearing mice injected with NCTD exhibited down-regulation of STAT3 phosphorylation, which indicated that STAT3 pathway was implicated in the effect of TAMs on HCC cells. Another effect of TAMs on tumor cells is induction of immunosuppressive state. TAMs triggered a rise of the intratumoral Foxp3+Treg population, which in turn promoted HCC progression . The prevalence of CD4+/CD25+Foxp3 T cells in TILs from hepatoma-bearing mice injected with NCTD was significantly lower than that injected with saline buffer. It has been reported that NCTD induced apoptosis of hepatocellular carcinoma cells . Notably, NCTD did not significantly inhibit H22 cell viability at 1-10 μM, although NCTD was capable of decreasing cell viability in a dose-dependent manner at higher concentrations (> 10 μM). However, 10 μM NCTD significantly induced macrophage M1 polarization, which indicated that NCTD could exert anti-tumor activity through modulating macrophage polarization at low dosage. The results obtained here suggest that, at least in part, NCTD exerts its anti-tumor effect in an indirect way via M1 macrophages. Increasing evidences showed that miR-214 was significantly down-regulated in hepatocellular carcinoma tissues and overexpression of miR-214 could inhibit HCC cell growth and invasion . As a tumor-suppressor, miR-214 downregulation was associated with the low clinical progression and poor prognosis of HCC . In this study, we found that miR-214 was involved in re-polarization of pro-tumorial M2 TAMs into antitumor M1 phenotype macrophages (Figure 5B). When miR-214 was overexpressed in TAMs, they re-polarized toward the M1 phenotype, in which TNF-a was significantly up-regulated and Arg1 was down-regulated. Of particular interest was a finding that TAMs over-expressed by miR-214 could decrease tumor cell survival and invasion. As a result, miR-214 exerted anti-tumor effect by regulating macrophages polarization. Our data also demonstrate that miR-214 is a target of NCTD modulating macrophage polarization in hepatocellular carcinoma environment. There are several lines of evidence to support this. First, miR-214 was significantly up-regulated in TAMs from NCTD-treated hepatocellular carcinoma tissue. Second, miR-214 expression was significantly increased in BMDMs or RAW 264.7 macrophages treated with NCTD. Third, β-catenin, a direct target of miR-214, could be down-regulated by NCTD. In this study, we have demonstrated that down-regulation of miR-214 expression could not only enhance β-catenin expression but also attenuate NCTD-induced decrease of β-catenin level. These data strongly suggest that the effect of NCTD on regulation of macrophage polarization is probably due to the up-regulation of miR-214 expression. To further reveal the functions of miR-214 in the effect of NCTD, we found that inhibition of miR-214 could reverse the effect of NCTD on tumor growth by M1 polarization. These results suggest that the effect of NCTD on macrophage polarization is partly mediated by stimulation of miR-214 overexpression. In summary, we demonstrated that NCTD effectively inhibited tumor growth in hepatoma-bearing mice. Our results also suggested that the effect of macrophage polarization associated with NCTD treatment was due to increase of miR-214 expression, which result in inhibition of β-catenin signaling pathway. Inactivation of STAT3 in TAMs and decrease of regulatory T cells population were involved in NCTD-treated TAMs exerting anti-HCC effects. This work was supported by grant from the Priority Academic Program of Jiangsu Higher Education Institutions. Corresponding author: Xuehao Wang, Mailing address: Center of Liver Transplantation, The First Affiliated Hospital of Nanjing Medical University, Nanjing 210029, China. Address: 300 Guangzhou Rd., Nanjing 210029, People's Republic of China. Tel: 86-25-83718836ext6476 Email: wangxhedu.cn.